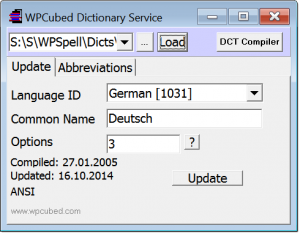 To add spellcheck to WPTools VCL Version 4, 5, 6, 7 and 8 you can use our product WPSpell. With WPSpell is easy to offer spell as you go: the misspelled words are underlined and can be corrected from the context menu. This spell checker is based on a popular spellcheck engine which was successful for many years. For the benefit of our customers we acquired the license to build a new spellchecking component based on a reliable technology. We adapted the technology to current needs. For example, all use of pointers in the spellcheck engine have been removed, and information has been added to the dictionaries. Alternatively you can also use the popular 3rd party product Addict Spell with WPTools. WPSpell has been especially tailored to work with WPTools. Complete source code for spellcheck engine included with registered version. 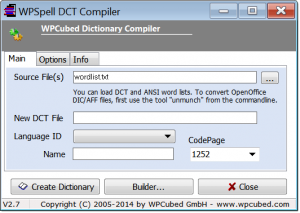 The registered version of WPSpell comes with applications to create a dictionary from a word list and to modify dictionaries to change options without having to recompile it. So it is possible to create your own dictionaries. We would be pleased if you allow us to add your dictionary to this list.